This month's AAA ride was due to be a Cambrian 100k with an ascent of the Gospel Pass, but some hard winter weather earlier in February left me wondering if it was smart to descend the Forest Road with possible ice hanging around. It was mild down in Bristol but on the north side of that pass in the shadow of the pines I could see myself hitting some dangerous road so I delayed that one to March and took on my local challenge - "Over The Mendips" - for the third time. 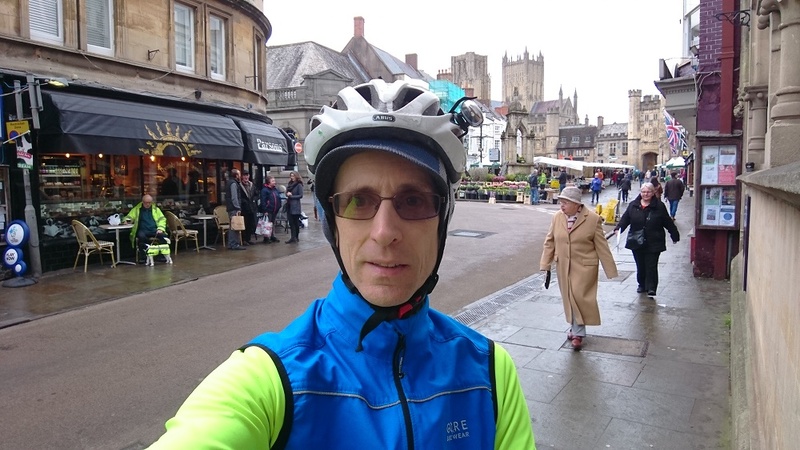 This time I started from Keynsham station which meant I only had 8 miles extra to do before I reached my start line in Chew Magna - that took 38 minutes including the time it took to pay for a chocolate bar in the Co-op to get a receipt for my start time. There used to be a cash machine by the church but cash machines are disappearing right now and that one has vanished leaving the shops the only option for a "control". There was no queue, just a dog walker wishing me well on the way out and asking where I was heading. Saying "Cheddar Gorge" always gets a reaction, but although it's the best known it's not the toughest climb of the route. I started with a brisk run past the lake to the first ascent - Harptree Hill. The signposts at the bottom are priceless - one second it's nine miles to Cheddar and the next thing you know the sign at the junction tells you it's six. Definitely a PB for 3 miles on the bike. Harptree Hill was a good challenge and once at the top it was a steady run into a headwind on the way south. The routesheet ticks off a list of ancient inns - Hunter's Lodge, Mendip Inn, Castle of Comfort. It's a straight line across the high ground the beautifully rugged, Dartmoor-esque Stockhill. After that it's a high speed descent into ancient Wells - a quick ATM for proof of passage and I was straight on out to Wookey Hole. The second climb came soon after and I reckon this is the hardest of the three - a steep blast up Ebbor Gorge with amazing views over the Levels. I've done this ride in summer and it's exquisite, in winter it's inevitably bleak (unsurprisingly Somerset, the Summer Land, looks better in summer) but on the other hand there are more gaps in the trees and hedges to see the view. In the distance Glastonbury was standing out above the plain like an island, clouds gathered around the Tor. Once through Priddy I took it easy down Cheddar Gorge before u-turning in Cheddar and heading back for the famous climb. It's a familiar road, a place I've hiked and biked numerous times, but the steep section under the pinnacles is always breathtaking. Looking up at the looming crags and dark towers of limestone I was strugling to think of a more sublime and dramatic spot anywhere in the world. True, it's overrun with tourists; hikers, cyclists, climbers, cavers; and developed more than any purist would like - but the gorgeous views that brought people here are still intact. I remember seeing the Himalayas from Kangra and how that view made me feel - and the Huang Shan when the mist lifted to reveal the sunlit shafts of rock topped with waving pines. At those times any english beauty seemed tame by comparison but when you get back home and see your local landscape you remember why it captivated you and why it always will. The ascent was great - I felt a surge of energy and took the climb on at a decent pace (by my standards - one quicker rider still overtook me) then made reasonable time back past the lakes with a hint of tailwind to assist. Once checked in again at the Co-op I realised I had 34 minutes to retrace my route to Keynsham unless I wanted to wait an extra 70 minutes for a train or ride the whole way home. Neither alternative seemed inviting so the last challenge of the day became Man versus Train as I time-trialled it through Norton Malreward and over the high ground around the A37. Outpacing my ride in the opposite direction with fresh legs three and a half hours earlier was never going to be easy, but I was well warmed up and made it with 2 minutes to spare. So that's 7 rides down, 5 to go, and I have a feeling this local 60k is going to feature again. One last time.